Watch the Electric eCOPO Camaro Concept Pull a Wheelie on a Drag Strip! After its SEMA appearance, the 2019 Chevrolet eCOPO Camaro made its debut on the drag strip, pulling a wheelie in the process. This isn’t a long piece as we’d love you to head straight to the video below and enjoy the sight of the 2019 Chevrolet eCOPO Camaro Concept popping a wheelie. During its debut outing on the drag strip, the electric drag race machine, did a convincing impersonation of a fighter jet ready to take off. The eCOPO Camaro Concept had made its first public appearance at the 2018 SEMA Show with four 200-volt battery modules powering its BorgWarner HVH electric motors. Power output is in the neighborhood of 700 hp, and over 600 lb-ft of torque is around to make things more fun. Completing a quarter-mile distance in 10.142 seconds at 130.85 mph, the electric eCOPO Camaro Concept sure qualifies as a capable drag racing car. It took on a souped-up truck in this round. 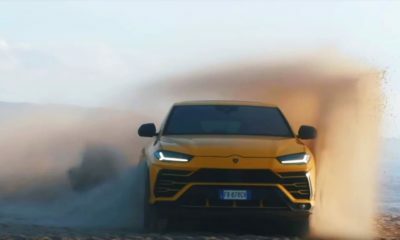 What we’d love to see is it taking on something more exciting and mainstream, like the Dodge Demon or even a Tesla Model S.
Based on the regular 2019 COPO Camaro with which the eCOPO shares its drivetrain and other components, this is still a concept. The electric drag racing team Hancock and Lane Racing who made the concept car, created a specimen which is built to perform than to just shine gloriously on an exhibition floor. Now it’s up to GM/Chevrolet to green-light this for production.